The competition on Sunday March 8th was a little low key. We got a late start due to the extremely strong wind blowing from the East. Later in the morning John Tonks decided to test out his aptly named Wind 110E in the conditions, and Johns' ability made it look easy. He flew a very impressive and tight F3A schedule with his plane flying at 45degrees through all the up and down lines even though the actual line was absolutley vertical (NO exaggeration). At the end of the flight he was doing continuous Snap Rolls in front of himself at a height of about 6M (20') with no forward movement . . impressive. Anyway, after that, we decided to get on with the comp. and fly the mandatory 3 rounds to qualify as a competition. John Tonks, Neil Martin and Jeff Boyd lined up for F3A. John's excellent handling of the windy conditions had him edge out a closely following Neil Martin, with Jeff Boyd 3rd. Matt Cosier and Peter Ukhoff flew in Expert and flew well, with Matt Cosier really starting to come to grips with the Pinnacle and putting in some good flights in the conditions. Matt took the win from Peter. 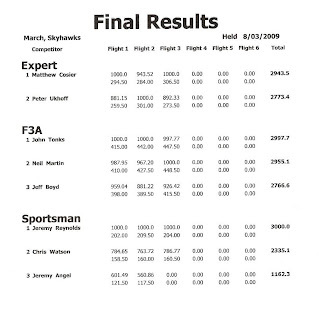 Sportsman class is becoming very competitive with Jeremy R and Chris flying very well with Jeremy R taking the win from Chris. Unfortunately, Jeremy Angel had another bout of engine troubles, however he will soon have his Comp-ARF Impact running and this will see Jeremy A quickly move through to the Advanced class. John Tonks picked up his third Masters Promo point and is once again an Australian F3A Masters ranked pilot. 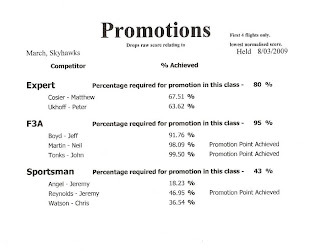 Neil Martin also earned a F3A Masters retainer point, while Jeremy Reynolds flew well and gained his second promo point leading to the "Advanced" class . . well done to all, especially considering the conditions. Thanks to the Skyhawks club for allowing us to use the field and for the great BBQ lunch. Due to the strong windy conditions, I am sure we didn't inconvenience anyone. The next SA Pattern Competition is not until May due to the Australian Masters in April and a number of SA pilots heading there. Some of you may have heard of JASON SHULMAN from the USA. 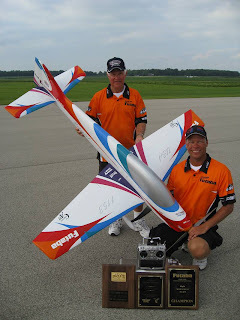 Jason is a 2 times USA F3A Champion, 6 times World Champs USA Team Member, and currently World No. 4 (World Champs - Argentina 2007). Jason is coming to Australia. He will be in Melbourne for practice and testing from the 17th April, then at Cootamundra, NSW for the Australian F3A Champs on the 20/21 April, before flying at the Australian Masters in Shepparton on April 23 to 26 and I am sure his flying will be super impressive and awe-inspiring. The South Australian F3A Team of John Tonks, Neil Martin, and Jeff Boyd will be competing with Jason in the F3A class at "The Masters". SA Expert class flyer, Matt Cosier and Sportsman class flyers Chris Watson and Jeremy Angel are also travelling over to compete in the event, so it should be a great weekend in Shepparton for the SA Guys.